If you're looking to advertise your brand in a fashionable and stylish way, ePromos has the perfect thing for you: customized promotional jackets! By design, they're meant to be worn in the great outdoors, meaning that with your logo prominently emblazoned on them, wearers will effectively become walking billboards for your brand. Keep your customers and employees shielded from the elements in style -- we have lighter fleece jackets, sweatshirts, vests and rain gear. No matter the weather, you can promote your business in style with logo jackets. Stop getting fleeced by poor promotional decisions and start browsing our selection of custom jackets! 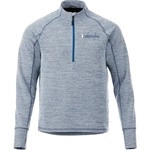 This mid-weight custom fleece provides warmth without weight as well as a great place for your company logo. These water resistant custom jackets are built for toughness and designed to stand the test of time! The versatility of these Elevate Packable Lightweight Custom Jackets allow you to take them with you everywhere you go. These value price Port Authority soft shell custom jackets will be the go to basic everyone will want to have in their wardrobe. These Sport-Tek moisture wicking custom jackets add a pop of color and style to your company employee apparel selection. Before you head out of the house, be prepared for unexpected weather with these lightweight Elevate Spark Lightweight Custom Jackets. This microfleece custom jacket is perfect either alone or layered. We have taken an old classic and put a modern spin by reworking these letterman custom jackets into a comfortable fleece. Upgrade your sense of style with these great Clique half-zip pullover custom jackets that everyone will admire. Add a cozy layer with our extra soft microfleece custom vest. These Team 365 performance custom jackets are as fashionable as they are functional and will make anyone who wears them stand out in the crowd. Function, style and comfort are combined together to make these Elevate Jersey Knit Custom Jackets perfect for any occasion. Great for traveling! The Pack-n-Go custom jacket is made of super soft material and feather light Softex polyester. Make your team look and feel like the champion they are in these amazing Team 365 championship custom jackets imprinted with your logo. These men's Elevate Jersey Knit Quarter Zip Custom Jackets are stylish enough for everyday use and functional enough for active lifestyles. Water resistant custom jackets that are built for toughness. These versatile Elevate Packable Lightweight Custom Jackets are the perfect logoed jacket to take them with you anywhere you go. Add these great Port Authority soft shell custom jackets to your list of must have go-to's for your employees corporate apparel items. These Sport-Tek moisture wicking custom jackets are the ideal promotional apparel item to you want seen at the gym or running around town. This women's Roots73 Traillake Custom Insulated Vest provides a classic look! It's perfect for transitioning seasons, ensuring recipients stay comfortable in all weather. Add your company's logo to this men's classic Roots73 Traillake Custom Insulated Vest! It's breathable and waterproof, making it perfect for fall and spring! Be prepared for unexpected weather whenever you leave the house with these lightweight Elevate Spark Lightweight Custom Jackets. The men’s North Face DryVent Custom Rain Jacket features an environmentally friendly membrane which is waterproof yet breathable and allows you to stay dry when out on the trails. The ultimate mid-weight option for active outdoor adventures. The men’s North Face Ridgeline Custom Soft Shell Jacket is constructed of a wind-resistant outer shell with a warm, gridded fleece interior. The women’s North Face Ridgeline Custom Soft Shell Jacket is constructed of a wind-resistant outer shell with a warm, gridded fleece interior. The ultimate mid-weight option for active outdoor adventures. This custom embroidered microfleece jacket is perfect either alone or layered. Contoured to fit your body! The women's North Face ThermoBall Trekker Custom Jacket is lightweight, highly compressible ThermoBall powered by PrimaLoft synthetic insulation. The men’s The North Face Sweater Custom Fleece Jacket is a soft, heather tone and adds casual appeal to the heavyweight, sweater-knit fleece jacket that’s warm, yet breathable. We took a favorite classic and reworked these letterman custom jackets into a comfortable fleece that everyone will love. Cover your core without restricting mobility with the women's North Face Ridgeline Soft Shell Custom Vest that provides wind-resistance and has a warm, technical gridded fleece interior for comfort. Cover your core without restricting mobility with the men's North Face Ridgeline Soft Shell Custom Vest that provides wind-resistance and has a warm, technical gridded fleece interior for comfort. The women’s North Face DryVent Custom Rain Jacket features an environmentally friendly membrane which is waterproof yet breathable and allows you to stay dry when out on the trails. Promotional jackets are a great way to get your foot in the door and let prospective new clients warm up to your business. Our comfy and stylish outerwear makes for fantastic raffle prizes and gift giveaways at trade shows and other events. And with so many styles and options to choose from, you'll definitely find something that works with your brand. We even have athletic, moisture-wicking promotional jackets for sporty types that love to jog or go on hikes in the chilly mornings. Come springtime, you can expect rain to fall, so treat your clients and employees to a customized rain jacket. When leaves finally start to change color in fall, you can help people warm up in the chilly weather with a selection of cozy fleeces, customized bomber jackets, or warm pullovers. For summertime, lightweight jackets and sweatshirts for the camp fire and wind breakers are sure to add a little warmth after sundown. For the chilly days of winter, choose from ePromos' extensive selection of custom outerwear. With your logo prominently displayed on any of these versatile custom embroidered jackets, your brand will be recognized all year round! With so many trusted brand names filling our inventory -- Columbia, Nike, Carhartt, Eddie Bauer, Patagonia, Puma, Under Armour, Port Authority, Cutter & Buck and more -- all in men’s, women’s and youth sizes, you'll be on the fast track to successfully promoting your business in no time! Start browsing our selection of logo jackets today and get in touch if you have any questions.